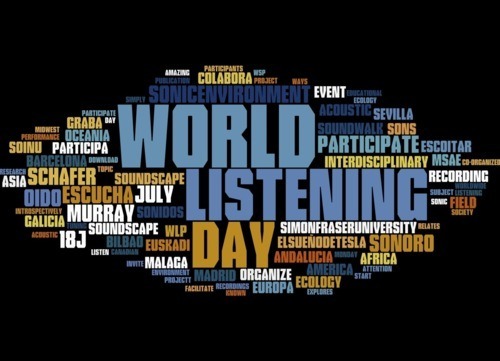 July 18 was chosen as the date for World Listening Day because it is the birthday of the Canadian composer R. Murray Schafer, who is one of the founders of the Acoustic Ecology movement. Schafer is also the author of The Soundscape: Our Sonic Environment and the Tuning of the World, a book that helped to define many of the terms involved with the acoustic ecology movement and inspired the title of The Upstate Soundscape. In honor of World Listening Day, The Upstate Soundscape will launch a new regular series called ‘Soundmarks.’ Schafer wrote that Soundmarks “make the acoustic life of a community unique.” The Upstate region has a diverse geographical setting that is filled with unique and interesting soundmarks. We will begin cataloging those soundmarks into a soundmap or sound survey, like those in Montreal and London. This is conceived as an open collaborative project that anyone can contribute to. All you need is a simple field recorder and an ear for the Soundmarks in your own environment. If you’d like to record a Soundmark and contribute it to the blog, email us at Upstatesoundscape@gmail.com for more info. To commemorate World Listening Day, we will post our first Soundmark tomorrow, which was contributed by Baird Buchanan, an Albany-based artist that records under the name Claymation. Check back tomorrow to take a listen and get a feel for what the Soundmarks will be like. Also, on this week’s episode of The Upstate Soundscape, the first hour of the show will be dedicated soundmarks, phonography, hydrophones, and music that makes use of field recordings in honor of World Listening Day. Probably no video better illustrates the concept of the ‘upstate soundscape’ then this one. Buffalo Grain Music, recorded on a bike ride through the city last February by Kyla Kegler, is a perfect representation of the acoustic ecology unique to a Rust Belt city like Buffalo. The playful re-invention of these decaying structures as haunted instruments by the these Buffalo bicyclists recalls R. Murray Schafer’s discussion of soundscapes and soundmarks (sounds that are unique to an area).